J.M. DeMatteis's CREATION POINT: THEY'RE BAAAACK! And, as always, Jack, I wish you the same. Kevin Maguire is incredible, isn't he, A. Jaye? The script is all done for this and we're waiting for the art: Can't wait to see it come alive in Kevin's inimitable style. I will definitely pick this up, J.M. No doubt about that. And, yes, Kevin is an incredible artist--I don't know of a comic book artist out there today that expresses the emotions/feelings through the characters more than Kevin does. Teamed with you inimitable sense of story, character and humour, this is gonna be classic! At the very least, A. Jaye, it's going to be fun. And thanks for the kind words! I haven't seen Kevin's art yet, Andrew, so I'm as excited as you are! We all saw a page or two on Twitpic the other day, as part of a post he made on some very unsavory sights at the Starbucks! What I can see in that photo looks great, Russ. I just hope Kevin doesn't spill any coffee on the pages! Kevin's art IS incredible and has only gotten better over time. Really looking forward to this one. Thanks, Drew. 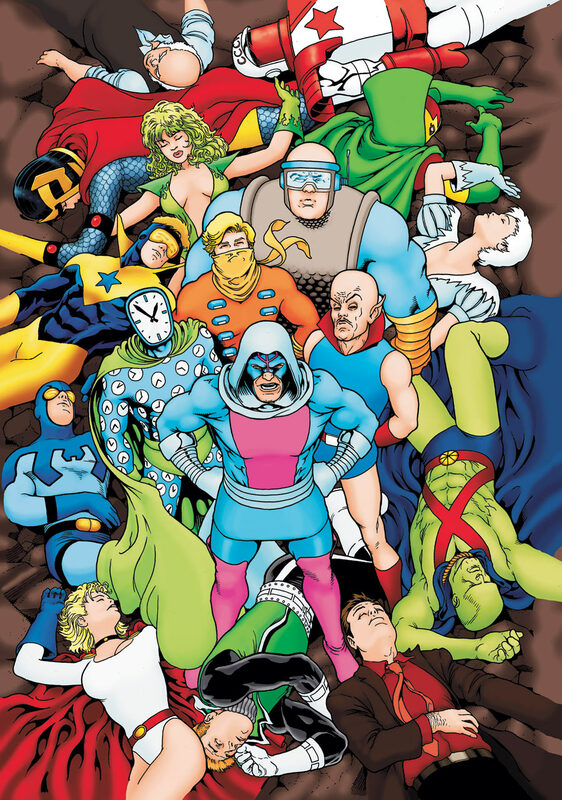 This JLI project really is our farewell to these characters. We've had our say and we're done. That said, I'd love to do a monthly -- something new and challenging -- with Keith and Kevin. Well, I'm there for anything you guys do. I really loved the Metal Men stories you did in Doom Patrol together. If you two could convince Kevin to do a monthly again - that would be amazing. Maybe have someone else fill in on art every couple months to help him keep up? Anything necessary would be worth it to have the three of you doing a monthly again together. I loved working on Metal Men...and I think it was some of Kevin's best ever. A MM monthly would be a dream, but I don't know if DC agrees!